This is such an easy appetizer idea! Cheesecake Stuffed Strawberries (we call them Strawberry Blossoms in my family) take about 10 minutes to put together, and are so elegant. They are perfect for Valentine's Day, Mother's Day, baby and bridal showers, New Year's Eve, etc. It's a super easy way to up the fancy on your event! Wash the strawberries and lay out on paper towels to dry. In a large bowl or stand mixture, beat the softened cream cheese until it is smooth. Make sure to scrape down the sides and bottom of the bowl and get out all the lumps. Beat in 1/4 cup powdered sugar and 1/4 cup sour cream. Add in a little vanilla if you like, it's optional but tasty! You can also add a tiny pinch of salt if you want. Taste it to see! 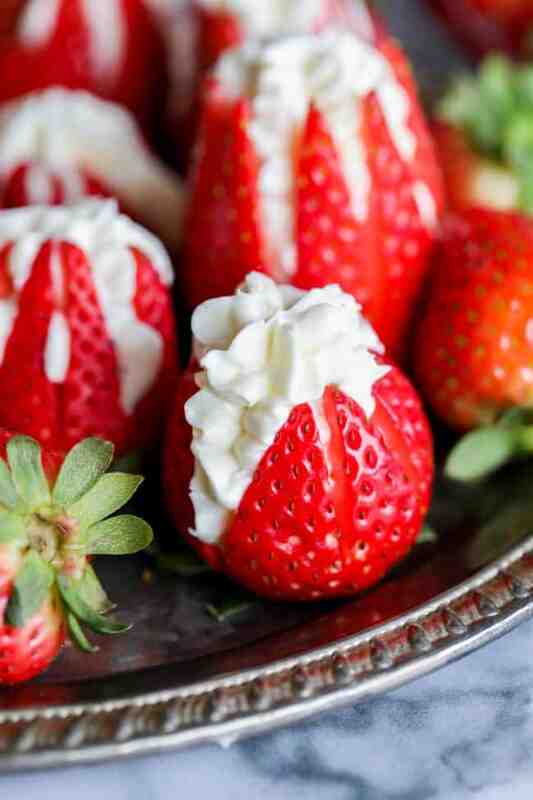 Decide if you want to leave the stems on the strawberries or remove them. They are easier to eat if the stems are removed (you can just pop the whole thing in your mouth) but they have a prettier presentation if you leave the stems on. If you leave stems on, make sure to only choose strawberries that will stand up reasonably well (pointy side up). If you are removing stems, cut all the strawberries so that they lay flat on your work surface, pointy sides up. With a sharp paring knife, carefully slice the strawberry in half vertically through the center to within 1/4 inch of the base. Cut each half into 3 wedges, forming 6 "petals." See photos! Place your finger in the center and pull the petals apart slightly, so that you have room to fit your piping bag inside. Prepare a piping bag with a large star tip. I used Wilton tip 2D, which is actually a "drop flower" tip. Any similar tip will work fine. Place the cheesecake filling into the piping bag. An easy way to filling a piping bag is to place it in an empty glass. (see photo) It's a lot easier to get the filling in there. If you don't have a pastry bag, just fill a ziplock bag and snip off one of the corners. Place the tip of the piping bag all the way down into the center of the strawberry and start filling. Use your fingers to arrange the "petals" of the strawberry as you move upward, so that the filling is distributed evenly. Serve immediately. You can prepare these about 2 hours ahead of time. Eventually the strawberries will start to wilt and the cream cheese filling will be stained red. Store covered in the fridge until ready to serve. Chocolate Dipped: Dip the bottom (flat) side of cheesecake filled strawberries (stems removed) in melted chocolate. Melt 2 cups of semi-sweet chocolate chips with 2 teaspoons shortening. Stir until smooth. Use a fork to dip the filled strawberry in the chocolate. Set on a baking sheet lined with parchment paper or wax paper to firm up. Graham crackers: crush a few graham crackers in a food processor or in a ziplock with a rolling pin. Sprinkle graham cracker crumbs over the top of each strawberry blossom, or you could dip the flat side of the strawberries in the crumbs. This recipe is from my Aunt Shirley! She's been making these for parties as long as I can remember.